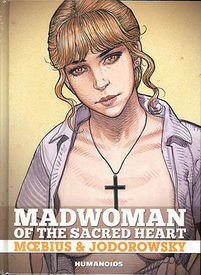 Moebius & Jodorowsky's Madwoman is, perhaps, the screwball comedy to end all screwball comedies. Opening on a French college campus, it starts out slow with what seems at first to be the beginnings of a fairly typical professorial indiscretion with an attractive younger student, but.... Well, we don't want to ruin it for you, as the primary pleasures of this work – after, of course, that provided by simply enjoying Moebius's splendid artwork – are the rapidly multiplying plot twists that make up this roller coaster ride of a book. It seems germane to point out at that, yes, the superficial characterizations on display here lean towards the stereotypical and, oh boy, yes, sexism is the order of the day – but, the outrageous plot has been concocted to turn these clichés inside out and point out the inherent folly in building a society based on such conventionalities (i.e., a patriarchal one), before, finally, setting everything back to right with what may very well be the definitive deux ex machina conclusion. So, buckle up and get ready for quite the ride.